You're probably asking yourself why would anyone need to "re-imagine" one of the purest Porsches ever built? At least that's what I thought when I first saw the headline. Then, I saw the renderings and pictures and after a few minutes of staring I decided I liked it. What is it you ask? 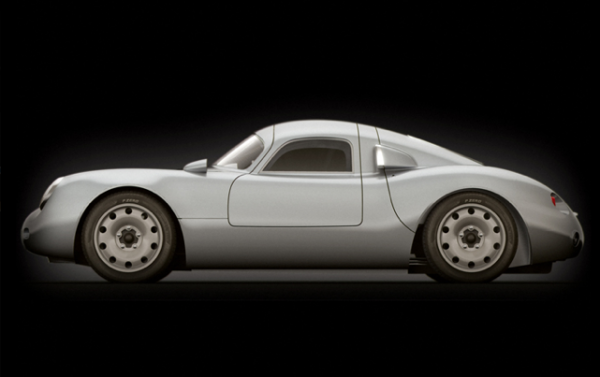 It's a tribute to the Porsche 550 in an updated, modernized form of a carbon-bodied, two-seater P550 from Vintech. Set to be unveiled during Historic Week on the Monterey Peninsula at the Quail Lodge on August 17th is this "stylistic reinterpretation" of the very first Porsche 550. According to the Vintech website, the team didn't look to create simple replica. Instead, they "wanted to keep as much of the character of the original vehicle while accepting to make the indispensable compromises in order to fabricate a completely functional vehicle that could be used according to more modern standards". Based on what we've read and the pictures on the Vintech blog, it looks like they might just have accomplished their goal. Said to be powered by a 3.0 liter, four-cylinder boxer engine capable of 270 hp, the Vintech P550 should be capable of serious performance if the reported weight of under 2200 lbs is true. The site doesn't discuss pricing or when the car will be available for sale. However, there is a clip of the motor mounted and running and it sounds pretty good to us. We'll update you on new information after the unveiling this coming weekend. Gullwing America’s P/904. A Porsche Replica That Must Be Built! How to buy a Lamborghini on a used Porsche budget.